We've been playing the first backer build of Julian Gollop's X-Com spiritual successor. 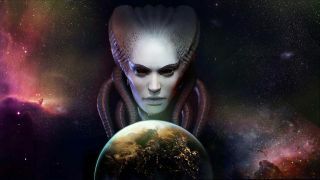 Tom and Sam have been playing the recently released first backer build of Julian Gollop's crowdsourced X-Com spiritual successor Phoenix Point. This is available to $40 tier backers of the game's Fig campaign, or anyone who pre-orders the game's 'Luxury Digital Edition' now at a steeper $50. Tom beat the Phoenix Point demo at the PC Gamer Weekender, but this build has been described to us by Snapshot Games as a fair bit trickier. This build also comes with a random map generator across two plot layouts, where the objective again is to take out every enemy with four soldiers. It basically functions as an early overview of the turn-based combat in the game. The setup of the mission is pretty simple: your squad of troops is doomed, infected by the virus that plagues all living things in the game. With that in mind, you have to kill all the enemies that occupy a location called Fort Freiheit, making the best of the grim fact you're all going to be dead soon anyway. After a few turns, the giant mutant queen arrives in the level, and races towards your troops. Here's how we got on. Samuel Roberts, UK editor-in-chief: I enjoyed this demo of Phoenix Point, Tom, even if it took a lot of trial-and-error to learn the best way to handle the game's enemies. What stands out is how the game incorporates flanking versus XCOM—how moving a soldier just a square or two over can open up an angle that'll do some serious damage to an alien enemy that had ended its turn pointing its fleshy shield—a portable cover point—in my soldier's direction. The idea of targeting different body parts has lots of potential to set this apart from XCOM, and the queen in this demo shows how that might offer interesting strategic choices. Taking out its pincers to impair its ability to do damage, for example, or destroying its legs to stop it running towards you. Damaging the queen's thorax enough to make it bleed—making it lose a certain amount of health per turn—almost helped me beat the thing. The potential for this system is less obvious with the standard enemies in this demo, but I like the idea that damaging different body parts affects them in different ways: affecting how many willpower points they have, or making them bleed, or how much overall damage it'll do to an enemy, or destroying their grenade arm. You can take a very granular approach to combat in each turn. Equally, your soldiers' body parts will be damaged in different ways—their guns can even be destroyed, which in this demo can make a huge difference to your chances of survival. How do you feel about the way flanking works in Phoenix Point? Tom Senior, UK online editor: It’s a significant change from XCOM’s decisive approach to flanking. You have to move out of the enemy’s forward arc to get your (massive) attack bonuses. Phoenix Point cares about the precise angle your gun has on the foe, so you can be in front and to the side of an enemy and make quite strong attacks. This rather undermines the poor shield crabs. They can move their shields to try and block shots, but it’s easy enough to make a short lateral move and get the shot you need. You’d think a crab would be particularly able to deal with enemies walking sideways, but there you go. This small detail illustrates the way that Phoenix Point is aiming to be a more detailed sandbox take on the X-Com formula. Firaxis’ XCOM is very boardgame-like. You move your soldiers like tokens and they get one big dice roll to hit an enemy. In Phoenix Point individual bullets have varying chances to hit or scatter, and the game rarely shows you percentage chances. Instead the enemy’s health bar flashes to indicate the potential damage you’re doing to a given bodypart. There are some new elements to the latest build of this demo that even move the game closer to something like Men of War. Your soldiers have backpacks and inventories, and you can pick up battlefield objects and discard your own kit. When one of my soldiers ran out of ammo I ran over to a box looking for more. I found just a grenade inside, which basically doomed that soldier to run at the enemy screaming and throwing bombs. The ammo restrictions are very punishing in this demo, which is nowhere near final balance, but the inventory system potentially means soldiers will be able to swap clips or scavenge new gear from the battlefield that you can use immediately. Samuel: I like the potential damage indicators in this, and it's a bit of a relief to not get hung up on percentages nearly as much as I would with Firaxis's XCOM. This seems like something that has the potential to change before release—earlier screenshots do show more percentages. But here, it feels like you've got all the information you need to make a decision, with predictive red squares that represent blocks of health as likely damage and potential damage. It's worth discussing the difficulty in this first backer build. It admittedly kicked my arse a bit, but isn't representative of the final game by any means. I asked Snapshot about how they're handling difficulty settings—they tell me they'll have a full range, and that the backer build hasn't been balanced. "You're also currently playing as a non-player faction and very limited skills [are] available," a spokesperson tells me. "There's so much still to be added in that the difficulty (amongst other things) should certainly not be taken as a representation of what to expect in the release build." It's worth taking it for what it is, then: an early slice of the game to give backers an idea of how the combat works. Ironman mode-loving XCOM fans might get a kick from the challenge as it stands. There's a huge appetite for XCOM alternatives right now, and I think the dynamic damage and individual limb targeting is enough to separate them even at this stage, despite the game looking superficially similar. Tom: The taskbar and the movement UI does make it look identical to XCOM in screenshots, but it already feels quite different. So much of the final experience isn’t represented here as well. The soldiers fit into familiar roles—assault, heavy, sniper—and I'd hope to see some variety here to put some distance between Phoenix Point and XCOM. Not that being like XCOM is a bad thing, I love those games, but the more PP can do to change things up, the more excited I will be. There’s the whole strategic layer yet to be revealed. I look forward to seeing more. Phoenix Point has a tentative release date of Q4 of 2018.